Federal Reserve Raises Key Interest Rate, Signals 2 More Increases This Year : The Two-Way The Fed also said it is looking to increase rates three times in 2018, as inflation approaches the central bank's target annual rate of 2 percent and the unemployment rate appears stable. "The Committee expects that economic conditions will evolve in a manner that will warrant gradual increases in the federal funds rate," the central bank said in its statement, pointing to recent increases in inflation to within its target rate and to the continued improvements in the labor market. The critical change, says PNC economist Gus Faucher, is that the Fed's previous statement had promised "only gradual increases." Removing the word "only" from Wednesday's statement gave the Fed greater leeway to increase rates more rapidly. "We're closing in, I think, on our employment objective; we're coming closer on our inflation objective. ... 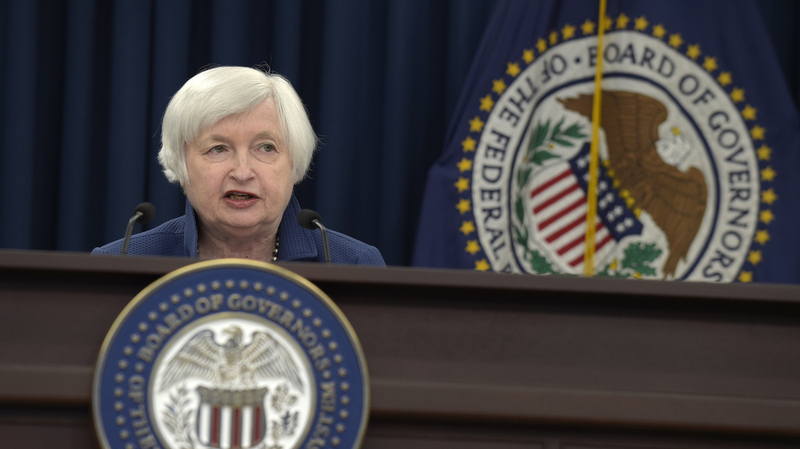 It looks to us to be appropriate to gradually raise the federal funds rate to neutral," Yellen said. She described "neutral" as a state where the central bank is neither putting on brakes nor accelerating monetary policy to juice the economy. "The economy still remains far below where it was predicted it should be in the beginning of the crisis," said Mike Konczal, a fellow at the Roosevelt Institute, in arguing for continued low rates. "The share of adults between the ages of 25 and 54 with a job hasn't even recovered to pre-Great Recession levels, which were, in turn, far below the peaks reached in the late 1990s," Josh Bivens, an economist with the Economic Policy Institute, wrote in a blog. "And, most importantly, no durable and significant acceleration of wage growth to healthy levels has happened yet." "Waiting too long to scale back some accommodation," she said, "could potentially require us to raise rates rapidly sometime down the road, which in turn could risk disrupting financial markets and pushing the economy into recession." A previous version of this story said the committee's vote was unanimous, but it was actually 9-1 with Neel Kashkari dissenting.